Elder health is important for Massachusetts residents over age 65, because they make up a little more than 13 percent of the state population. Nursing home occupancy is declining as seniors live longer and select assisted living instead. Assisted living gives older adults a safe, clean and supervised place to call home in their sunset years. But without care and attention, the transition from home can disrupt elder health and comfort and extend the anxiety of transitioning to assisted living. Moving is very disrupting for an aging parent already dealing with memory issues, heart disease, reduced mobility, or depression. Leaving a familiar home can mean saying goodbye to a neighborhood full old friends, and attending an unfamiliar house of worship. Despite the family and living facility’s best efforts to ensure the aging parent feels safe during the move and adjusts well, the loss of continuity brings with it feelings of abandonment and a host of other issues. Many of these can be overcome with a little TLC, including keeping companion care going for awhile in your loved one’s new surroundings. Home Helpers encourage those in their care to get involved with their new community by attending staff-organized events, joining in group activities, and socializing with their new neighbors. Home Helpers can help organize the new living space. Personal grooming items, appointment books, telephones, and blood pressure monitors can all be placed to make them easy to find and use. For people with moderate Alzheimers, searching for frequently used objects in their new home can increase stress. Moving causes disruption to long-established routines. Companion caregivers know their clients’ routines and help to reestablish them or find new routines in the new location. For example, your aging parent may have swept the front walk every morning, and their home helper may suggest another light chore or excuse to step outside every morning. The Home Helper can communicate care routines and preferences to Assisted Living staff. Does the companion caregiver also give rides and accompany your aging parent to appointments or church? if you want, your senior care agency can continue provide elder transportation around the Boston area to known places and stay to help with safety and mobility. The choice of whether to continue hiring companion caregivers is personal. 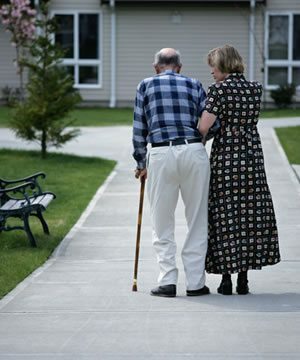 The amount and duration of companion care after your love one is placed varies from one family situation to the next. Extending that care greatly eases the distress elderly people feel during the move and increases the likelihood that they will soon thrive in their new surroundings.